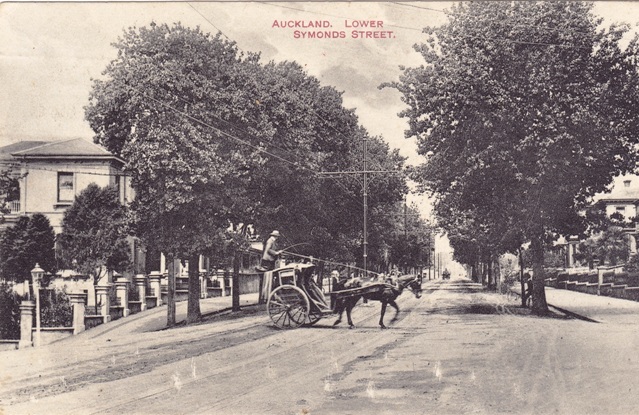 Having made some recent postcard purchases, there were three which I wanted to compare with today's scenes in Auckland, plus have a bit of a wander in the Victoria Park/Wynyard Quarter neighbourhood. So, off I wandered on Friday, December 14. 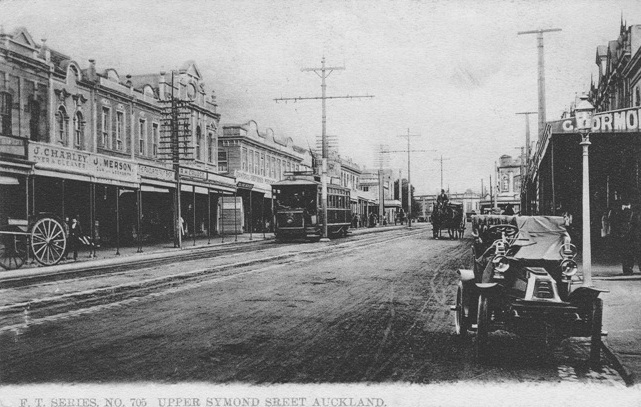 Upper Symonds Street since the historic image was taken has been widened; the shops in the old photo would be roughly just back from the line of trees and gardens in the middle of the road. I couldn't quite get a shot showing the Edinburgh Castle on the rear right, out of concerns that I might get run over, but the former Eden Vine Hotel is still visible at the rear distance. The older shops on the left were all demolished around the time of the road widening in the late 20th century. This one I had to guess -- I think the curve downward in the footpath and wall at the extreme left in the historic image is the beginning of Grafton Road from Symonds Street, so this is approximately where I took the shot yesterday. The University of Auckland has taken over the scene, with only the trees hanging in there as reminders of the past. You haven't a hope of seeing the fine tower of St Matthews-in-the-City anymore from the intersection of Wellesley and Victoria Streets. Boys and men would take their lives in their hands choosing to stroll down the hill in the middle of the road these days. Even an extra shot looking up Wellesley Street -- there's nothing left of a neighbourhood which, at the time of the historic image, was mainly residential. 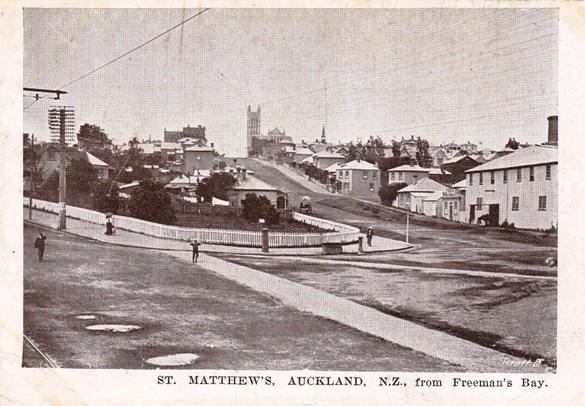 Victoria Park: result of a series of reclamations from the 1870s to 1900, filling in what had been the real Freeman's Bay to create commercial and industrial sites leased by the Auckland Harbour Board, and this reserve, taken over by the Auckland City Council in 1903 on a 50-year lease, at £500 per annum. (Star, 19 January 1903) The Council certainly invested a lot in the park right from the start. In connection with the formation of Victoria Park on the Freeman's Bay reclamation, an amount of work is at present being done under the supervision of Mr. W. Anderson. The work of erecting a seven-foot corrugated iron fence all round the 18 acres reserve is at present being done by the contractor Mr. G. Knight, and the cost of this work alone will be about £1200. Four entrances to the Park are arranged for. Fronting Patteson street will be the main entrance, 100 ft in width. Four handsome stone pillars are at present being erected, and between will be a handsome iron railing and gates. The entrance in Trafalgar street (fronting the gasworks) is 50ft in width, and will have similar stone pillars, iron railings and gates. Another entrance is from Custom-street West, which is also 50ft in width. On the water frontage there are also two four foot gates, one at each side of where the pavilion is to be erected. This pavilion is to be 130 ft in length, and will have the back towards Te Moana road. A great portion of the fence is now erected, and masons are at work on the pillars, which are of blue stone. Fifteen feet inside of the fence will be a row of silver birch trees, planted 30ft apart in fact, men are at present engaged digging the holes and erecting the guards. Triangular corners between the fence and the avenue of trees arc to be planted with various shrubs. Inside the avenue of trees is to be constructed a carriage drive 20ft in width, which will go right round the sports ground. From this will be 20ft of grassy slope, as the carriage drive is three feet above the main part of the Park. This will afford a lot of space for people to sit on and watch sports. The design for the Park is manifestly for a recreation ground only. Formation work is at present proceeding, the contractors Messrs. Mays and Gordon, having got about a dozen drays at work, as well as teams busy ploughing. The main ground has to be levelled, and the embankment formed for the carriage drive and slope. The cost of these formation works will be about £1400. It will not be possible to get the ground ready for putting down in grass this season, as some time will be required for the embankments to settle. This is unfortunate, as it means paying £500 per annum rent all the same, but this kind of work cannot be hurried. Judging by the condition of the ground after the recent rain, it would seem as if some provision should be made for draining, if ever it is intended to use the place as a sports ground in winter. The planting and grassing of the Park will probably cost fully £2000 before it is completed, so that by the time the pavilion is also erected there will not be much left of the £8000 borrowed for the Victoria Park in Freeman's Bay. I don't know if anyone has sat down to do a detailed history of Victoria Park, but it deserves more than just this single and corroded plaque on a concrete plinth, referring to just two-to-three years out of the story. The park opened in 1905. 1919 - John Court donated a playground, worth £1700. 1993 - Park levelled and drained. ... while a short distance beyond the playground, facing the old destructor buildings (now Victoria Park Market) and in the shadow of the viaduct -- the newly restored Campbell Free Kindergarten. This building does have its history (for the moment) displayed behind its windows for passers-by to read. In 1908 the Auckland Kindergarten Association was formed, and in 1909 they approached the Auckland Harbour Board for a lease of one of the Board's sites. The Association then sought help from Si John Logan Campbell, who guaranteed the finance for the building, provided that the building was kept open as a free kindergarten school. As the stone says above "to the little children of Auckland for all time." It was designed by Campbell's architect of choice, Charles Le Neve Arnold, and officially opened 19 October 1910. A sunroom was added to the building in 1938, and extra space was acquired for the playground in 1945 -- but the end of the laughter of little children echoing against the bricks and mortar came with plans for the harbour bridge, and its associated motorway viaduct across the park, and right next to the school. The Association decided to relocate in 1957, and from the early 1960s the building became club rooms for the Grafton United Cricket Club and Ponsonby Soccer Club. By the early 1990s, the building was vacant, derelict, and under threat of demolition. An image of how it was for so many years from 1993 until now can be found the NZ Historic Places Trust register. The building received category B protection under the Auckland City Council District Plan in 1997, and was registered as a category 1 by the NZHPT in 2000. Conservation architects were called in to assess restoration requirements in 2008, and the building was reopened on 5 May 2012. It's still empty, though. Who knows what fate lies in store for the old landmark, still in the shadow of progress? Next, something I've seen tons of times while passing by on buses, and wanted to find out about. "Homage to Will", an artwork from 1971 (done in conjunction with the Auckland City centennial) by American sculptor Fred Loopstra, part of an International Sculpture Symposium. "Five international sculptors were commissioned to make permanent sculptures on sites around Auckland City as part of Auckland City's centenary celebrations. Organised by the NZ Society of Sculptors and Painters (NZSSP), Hiroaki Ueda (Japan); Michio Ihara (Japan); Helen Escobedo (Mexico); Fred Loopstra (USA) and Tom Burrows (Canada) came to New Zealand and constructed their works or instigated their construction during a five week period from mid August, 1971." Michio Ihara's work is "Wind Tree", now successfully installed in the Wynyard Quarter; Hiroaki Ueda's "Opened Stone" was installed by the Art Gallery; Helen Escbedo's "Signals" is at the Fred Ambler Lookout in Parnell; while Tom Burrows' work in scrap metal was ultimately scrapped entirely by the Council in 1977. According to the Eugene Register-Guard Emerald Empire of 10 October 1971, "Homage to Will" is Loopstra's memorial to someone named Will T Brabham, a farmer who had died in 1971 after living in Crow, Oregon, for 75 years. "Loopstra's giant sculpture is 8 feet high, 16 feet wide and 26 feet long. It depicts New Zealand's pioneering and agrarian past. While it looks like farm implements, especially discs and plows, it is not quite any of these but represents them all, Loopstra ... explains. All I've seen up to now was the rear view of this building. The Caretaker's Lodge at Victoria Park, though, is a bit of a stunner. According to research by Matthews & Matthews, the lodge was built in 1906 to the design of a little-known architect named Arthur Bibra Herrold. Herrold possibly arrived with his parents on the Margaret Galbraith in 1881, with earliest found advertisement for his own practice in 1908, two years after the lodge was completed. He was living in Fiji in 1918, but died back in Auckland in 1943. According to the NZHPT, he designed the Cambridge Town Hall (1909), Monavale Homestead in Cambridge (1910), and Warkworth Town Hall (1911). Sadly, although the exterior is beautifully restored, the building remains closed. The homeless use the verandahs as a place to doss down -- their sleeping bags and mattresses were very much in evidence when I visited. Update 14 June 2013: The Lodge is now the Greenkeeper Cafe. That's good news. Thanks to Leigh Kennaway for the head's up. When I visited Halsey Street back when the trams had started up there, I did wonder about the bits of rough masonry not quite level with the rest of the footpath. Yesterday it clicked: that I was looking at what remains of Julian's Wall. J Thomas Julian won a £15,426 contract in 1907 to erect a 1850 foot eastern wall for the reclamation at Freeman's Bay which would form the beginnings of the Wynyard Quarter. Work on the wall, on average 8 feet thick, was completed in 1908. Halsey Street was formed as a result of this work, around 1912-1914. Julian (1843-1921) arrived in Auckland in 1883, with nearly 20 years experience in the building trade, including acting as foreman for several large building firms. In Auckland, he is said to have erected “a number of fine buildings in the city and suburbs”including a row of shops in Symonds Street, Arkell’s brewery, the City Club Hotel, and the block which included the Naval and Family Hotel, amongst others. 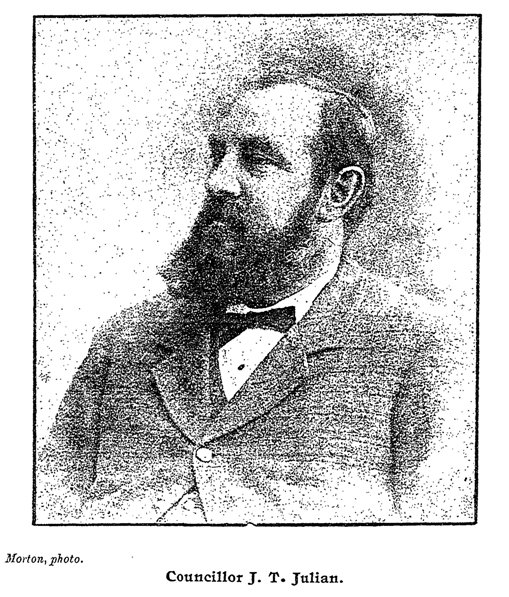 He was also a member of the Auckland City Council for the South Ward from 1891-1899, and chairman of the Auckland Harbour Board from 1903-1904. In other roles, he was vice-commodore of the Waitemata Boating Club, and vice-president of the Auckland Swimming Club. The trams are bedecked for the season. I must say I'm fond of the colour added to the Tank Farm. The art, plus C K Stead's poem on Auckland. adds to the views wonderfully. Last thing on the day's journey -- an old sign spotted after the present one for the razor shop was damaged on Pitt Street. Some sort of a music centre there -- post World War II? If anyone has info they'd like to share, please do so.